Pagani’s Restaurant was where it all began. On 12th March 1928 a group of eminent British motor racing personalities met to combine the dinners of Dr Dudley Benjafield with the concept of Brooklands chief timekeeper ‘Ebby’ Ebblewhite into the British Racing Drivers’ Club. It was decided that only proper racing drivers should be eligible for membership together with such others, ‘Ebby’ being a prime example, might be deemed to have made an outstanding contribution to the sport. 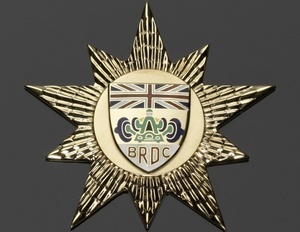 It was agreed only one award of merit should be presented each year in the form of a gold plaque as suggested in the design submitted by the Hon Secretary and to cost not more than £14. Mr Ebblewhite presented a scheme and, as time did not permit the details being debated, it was decided to discuss the matter at a special meeting on Monday 8th October at Pagani’s at 6.30 pm. Capt Campbell and Mr Don agreed not to attend as it later became clear they were likely recipients. After a long discussion, it was decided that an aggregate system should be adopted to decide the winner of the Award of Merit. Each world record was worth 12 points compared with winning a Grand Prix or Le Mans which scored eight. As the first driver to exceed 130 mph on the Brooklands Outer Circuit and winner of the first Ards Tourist Trophy, it was Dublin-born Don who was awarded this unique plaque. Before the end of January 1929 the Committee had decided that, in addition to a “Championship Trophy”, up to three Stars should be given each year as awards of merit. A ballot at the December meeting decided that the recipients of these first three stars should be Sir Henry Segrave for breaking the Land Speed Record at Daytona with the Sunbeam Golden Arrow, Malcolm Campbell for some lesser records at Verneuk Pan in South Africa, and Sammy Davis for his track racing successes. Kaye Don won the points-based Championship Trophy but this award was dropped from 1930 onwards as the Stars became ascendant. Throughout the 1930s at least two Gold Stars were awarded annually on a points basis for success in track and road racing respectively, with a third available for “outstanding performances” at the discretion of the Committee. Curiously, for 1931 it was decided that “it was not possible to select any outstanding achievement, and it was therefore decided not to make such award”. That was in October, Sir Malcolm Campbell having earlier in the year set a new Land Speed Record at some 246 mph – not outstanding enough it seems. However, the Committee had second thoughts a few weeks later and gave the Award to George Eyston for achieving 100 miles in the hour in his 750cc MG EX120. But nothing for Sir Malcolm. In 1938 no less than six Gold Stars were awarded, three for record breaking, one to Richard Seaman for winning the German Grand Prix and the two road racing and track Stars, the former to “B Bira” who achieved his hat trick and gave rise to Prince Chula’s book of the same name. After World War 2, Bira’s hat trick paled by comparison with the extraordinary achievement of Stirling Moss who, from being the youngest ever winner of a Gold Star at the age of 21 in 1950, took the points-based Award every year of that decade apart from 1953 when Mike Hawthorn’s first season with Ferrari earned him his first Gold Star. Mike’s second came almost posthumously for winning the World Championship in 1958. In more recent times hat tricks and better have been achieved, usually by the top British Formula 1 driver of the day, but only one man has won three in one year – the great Jim Clark in his annus mirabilis of 1965 when he won both the World Championship and the Indianapolis 500 quite apart from many other races to give him an unassailable points total. Only once has there been a tie on points – in 1989 when Nigel Mansell’s first year with Ferrari brought podiums or retirements while Kenny Acheson enjoyed a superb season with the Group C Sauber. For 1977 the then Club Secretary, Pierre Aumonier, recommended to the Club’s Board that there should be an equivalent Award for the most successful Club member competing in UK events and thus was born the Silver Star. Today this is focused on the three major British championships in which Members compete: the BTCC, British F3 and British GT. With more chances to score points, this tends to favour the Touring Car drivers but, unlike the Gold Star where all races count, Members can only include their best 12 results and exceptional seasons, such as Gary Paffett enjoyed in F3 in 2000 and Andrew Kirkaldy in British GT in 2005, can see off the BTCC brigade.